Imagine you are relaxing at home one day, sipping a can of beer and enjoying your day off, when suddenly a mysterious vinyl record is slipped under your door. Curious, you play the disc and heavy metal comes on, summoning a demon who tells you to “enjoy your sobriety” as he chops off your arm and steals your booze. In raging defense, you reach over for the vinyl and chop off the demon’s arm with it. As he runs away with your precious stash, you attach its limp arm to where your old arm used to be, and now you have the ability to shoot fireballs out of your hand. And what do you do next? You enter hell with only one thing in mind: to get your beer back. 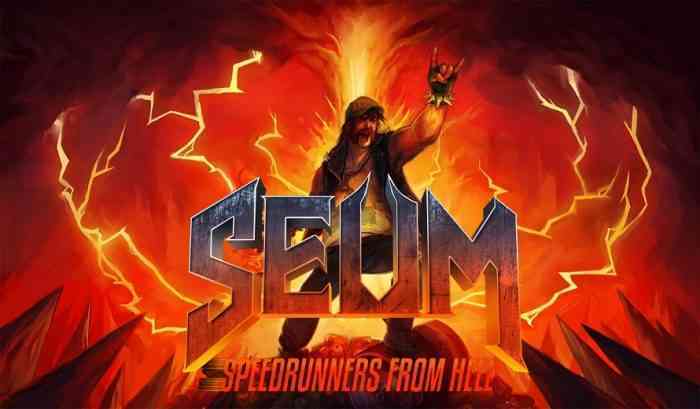 SEUM: Speedrunners from Hell, as crazy as the storyline sounds, works. It is silly, fun, and the one-minute comic-strip introduction helps us players understand why, out of all the places in the world, we are speedrunning in hell. 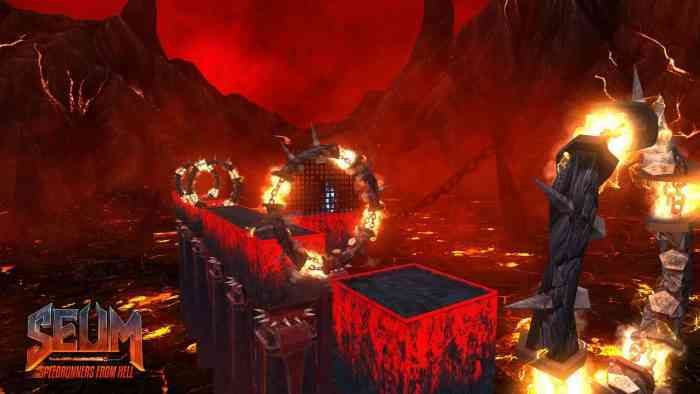 It explains all the obstacles we encounter, such as the crazy pits of lava, spikes lining the walls and the floors, saws running along the ground, and axes swinging from the ceiling. Also, the storyline gives us a goal in the game. It is not just about speedrunning and platforming, we really want our beer back and we are going to do anything to get it. Being a first-person platformer, your only point of reference is your demon hand sticking out in the bottom right corner. Without it, it would likely be more difficult to run without falling off a ledge. Several levels require you to actually use your demon hand; it isn’t just an accessory of badassery (although the heavy metal music that plays in the background while you are running is pretty badass). Sometimes you have to aim and shoot your fireballs to activate certain machines, for example, or to reveal hidden areas. 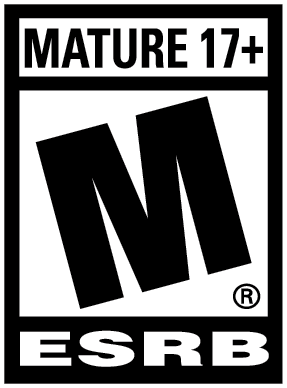 The speedrunning and first-person platforming is also timed to the millisecond. During the first few runs, I definitely struggled with meeting the level’s passing time. Each level usually takes around ten seconds to complete if you don’t make a wrong move. Of course, there is no expectation that a player makes every run on their first try. Some runs also introduce something new, from trampolines to anti-gravity to time reversal. There is definitely a learning curve with SEUM, and it does get progressively more difficult. For some levels, you will have to be patient and explore the map a bit before you can find the right path to the end. Fortunately, there is an option of restarting your run if you know you can’t make the time. An even better part about that is the restart is instantaneous so you don’t have to wait for a loading screen to try again. If you beat a level but want to master the run, you can replay it over and over again until you are satisfied with your time. One of the fun challenges of SEUM is the leaderboard. If you are connected online, you can see the leaderboard with information on which player got what time on any level. It is a great tool to compare your score with the community and to challenge yourself to see what’s the best time you can make. If you are aiming for the top, you are allowed to attempt the same level an infinite amount of times, so you can keep running the same map for as long as you wish. 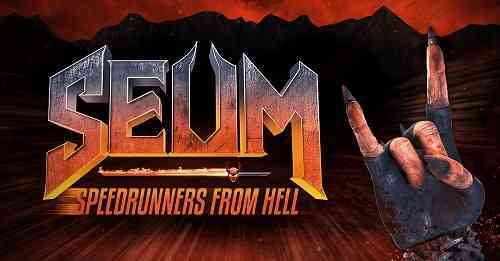 For players who want a change of pace, there are several modes of play for SEUM. The one we usually start with is Single Player mode, where we run, beat a time, and advance to the next level. There is also Speedrun Mode and Endless Mode. For every floor in hell, there are ten levels. Speedrun Mode lets you replay a floor of your choice or all the floors combined for the truly ambitious. As an example, to replay the first ten levels, you would choose Floor 1. It is also timed – so when you speedrun through Floor 1 but you die on level 4, you will restart from the beginning of level 4 and it just adds to your time. For Endless Mode, you play a map that never ends (until you die), the goal being to get as far as possible. When I first started playing the game SEUM: Speedrunners from Hell, I was thinking to myself: “There is no way I would ever be good at this”, as I fell off a platform and into the depths of hell for the tenth time. Of course, prior to this game, I was also probably the worst platformer in the world. As practice makes perfect, I finally grasped the controls, but as the levels got harder and harder, I frequently found myself being impaled or melting in pits of lava. Nevertheless, if someone like me could enjoy speedrunning and do pretty well, I believe this game is suitable for both casual speedrunners and veterans alike. Sure it can be frustrating to die so many times, but there are zero consequences because you literally have endless lives to lose.